The use of pesticides and their possible health effects is a subject that gives rise to much public concern and discussion. There have been reports of ill health attributed to pesticide exposure. 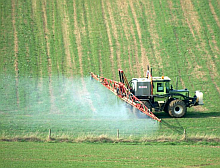 In particular, some people living next to agricultural land, rightly or wrongly, attribute health problems to their exposure from pesticides sprayed on these fields. There is currently a lack of reliable exposure information for residents and bystanders in the UK. In a previous study, we showed that the methods currently used for assessing pesticide exposure for regulatory purposes were appropriate for farm workers. However, the method appeared to underestimate the actual levels of exposure for bystanders. No measurements were collected for residents and it was recommended that further work be carried out to collect measurements to determine if current tools and methods are appropriate for assessing exposure for residents living near fields. In Great Britain the use of pesticides in agriculture, horticulture, forestry, food storage and the home or garden is regulated to protect human health and the environment. The regulatory system is administered by the Department for Environment, Food and Rural Affairs (DEFRA). DEFRA have asked that the Institute of Occupational Medicine (IOM) to investigate pesticide exposure during the spraying season amongst residents (adults and children) living next to agricultural fields and to assess if the current pesticide regulatory system provides suitable protection for those people exposed.